Right Here When it Comes to Taking Your Business To The Next Level. 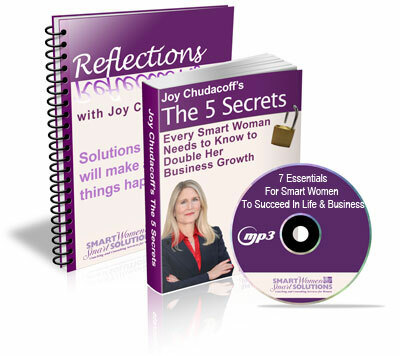 FREE Special Report: "The 5 Secrets Every Smart Woman Needs to Know to Double Her Business Growth"
"The 7 Essentials For Smart Women To Succeed In Life & Business"
FREE Subscription to my buzz-generating weekly enewsletter, Reflections. I’ll see you on the next page! "Since I have worked with Joy in our Success Circle, I have gained peace of mind and time. By teaching me the concept of “batching,” Joy has taught me that it is okay not to instantaneously respond to every call or e-mail that comes in. She has also helped me to pinpoint my target market so that I can focus my marketing dollars in these areas. I love Joy and her enthusiasm and energy. As they say, words cannot express, how much I enjoy and grow through our Success Circle. I highly recommend Joy to any woman looking to grow her business, and to “have it all”!"